UT undergrads Ashlyn Zare, Jackie Rambo, and Daniel Ortega-Arroyo. Photo by Rob Porritt. 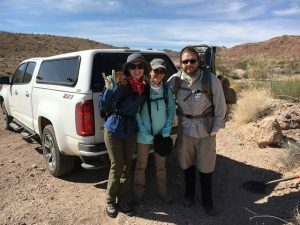 Rob Porritt, a UTIG postdoc, along with three UT Geology undergraduate students traveled to the Mojave desert in California in May to deploy 19 broadband seismic sensors. All were successfully placed over the course of six arduous days in the desert. The trip is part of an experiment designed to test the mode of deformation in the lower crust in a relatively young fault system and is funded by the Southern California Earthquake Center (SCEC). The multi-disciplinary team from UT Austin (Professor Whitney Behr and Professor Thorsten Becker) and the University of Colorado, Boulder (Professor Vera Schulte-Pelkum) will use the data recorded by the experiment for fine-scale imaging of the active fault system and compare our results with information derived from mantle xenoliths. Various seismological analyses will be available, including locating earthquakes, estimating shear wave anisotropy, isolating converted waves, and full-waveform imaging at the crustal scale. “I’m excited for the data to start rolling in as these sites should be some of the quietest sites ever deployed in a passive, temporary array,” he said. Installing a sensor. Photo by Rob Porritt. To carry the sensors and equipments they made use of frame packs minus the backpack part. This allowed them to strap all types of equipment, including shovels, to their back that came in extra handy as they hiked over hills, creek beds, and valleys. Each day they hiked about 10 kilometers, totaling about 50 kilometers over 5 days. 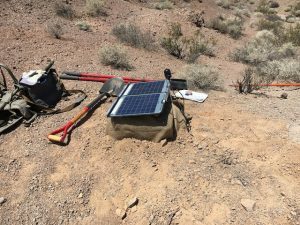 Additionally, their permits specified that the stations were deployed within 15 meters of their specified locations to avoid desert tortoise burrows. While they didn’t see any tortoises, they did see leopard print lizards, hares, and desert rats while hiking and working. A sensor fully installed. Photo by Rob Porritt. The team used quick deploy boxes, which only took about one hour to install as opposed to the usual 3-4 hours. These boxes are a fairly new development thanks to new compact sensors, digitizers, and Lithium batteries. They are able to fit all the components for a station into one convenient box and hike them in, whereas previous stations would require hauling multiple large components and multiple trips between the truck and the site. Standard systems require a 65-100lbs lead battery, ~40lbs and difficult to carry sensor, ~50lbs of concrete, ~50lbs sand, ~30lbs of water to mix with the concrete, and an awkward and heavy solar panel and stand. Our boxes are not only compact and quick to install, but they leave no lasting footprint after removal. Rob will return to the desert in four to six months to collect the data and check the sites. 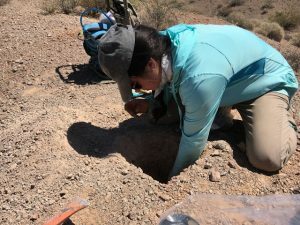 The sensors will be in place for two years at the most per an agreement with Mojave National Preserve and Bureau of Land Management – Mojave Trails National Monument. After that they will remove the sensors and find them a new home.